As basketball evolves, coaches are always looking for new offensive ideas that will help them create an edge. This video is THE most comprehensive presentation of the offensive strategy of Hall of Fame Coach Bo Ryan! Using a whole-part-whole method, Bo Ryan introduces and provides the background knowledge necessary to building the Swing Offense from the ground up. He covers every aspect of an offensive game plan; from man to zone offense, out-of bounds plays from the sideline and baseline, full-court press attacks, late game plays, attacking half-court pressure, and 20 quick hitters. You'll get nearly four hours of Coach Ryan teaching, correcting, installing and practicing offensive strategies for all levels of basketball. Coach Ryan has long been known for his "Swing Offense" that features precise spacing, pace on cuts and screens, and relentless attacks on the rim. He starts with the installation of the Swing Offense vs. man defense, teaching the basics of the offense, first using 5-on-0 drills showing the up screen, back screen and fade screen principles that are the hallmarks of the offense. Ryan then transitions to teaching the offense and making adjustments for the players in 5-on-5 situations. The video then teaches you how to use a variety of ball screen actions as the shot clock winds down to create scoring opportunities once the continuity aspect of the offense has been defended. Within the offense, there are a variety of entries and counters that Coach Ryan explains with great detail. Every opponent will defend certain actions differently, and Ryan makes sure you are well prepared for anything a defense may throw at your team. In addition to the Swing Offense, Ryan explains how his fast-paced transition offense seamlessly flows into the Swing. He demonstrates how to get high percentage shots early in the shot clock through various reads within his transition game. Everything he teaches is done with great pace, which puts the defense in multiple closeout positions and gives the offense a huge advantage. Coach Ryan provides sets that will help you attack in special situations, baseline out of bounds plays, sideline out of bounds plays and full court plays for different situations. He provides reasoning for using the sets and how to manage the clock. The quick-hitters give your players some different formations to attack man defenses, including pressure releases, taking advantages of mismatches, getting the ball to certain players in certain areas of the court, providing offensive rebounding tips and techniques, and providing multiple ways for your players to be successful on the offensive of the ball. Special situations from out of bounds are covered from both the sideline and baseline to attack both man and zone defenses with multiple sets shown with a multitude of options. Ryan demonstrates various breakdown drills that will show you how to teach certain concepts and formations within the Swing Offense. He creates building blocks within his breakdown drills that make it easy to apply them in a practice situation. He emphasizes the importance of running your drills with no defense as well as in live action. This allows players to learn the concepts in both a controlled and uncontrolled environment. 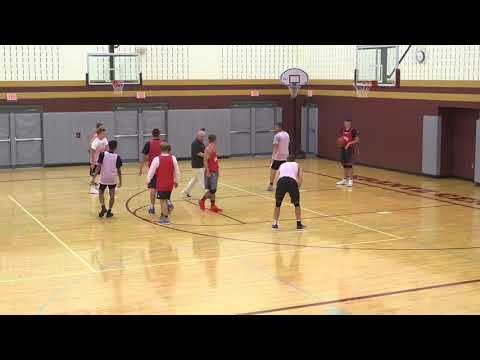 If you are looking for a half court man-to-man defense that turns up the pressure and can work at any level, then this video is for you! Legendary basketball coach, Bo Ryan, has built a hall of fame career with strong defensive teams. Coach Ryan shares everything in this extensive breakdown into his defensive philosophy. You will learn a system that increases pressure without leaving the rim exposed. You'll also see a defense that limits fouls and maximizes turnovers and low percentage shots. Additionally, you'll learn how Coach Ryan builds this defense with capable defenders through a collection of 12 defensive drills. To top it all off, you'll get strategies for post defense, countering numerous screening actions, and extending your defense to full court pressure. Coach Ryan begins by explaining the general principles to his defensive philosophy. The concepts will help you force turnovers, limit fouls, and force opponents into taking bad shots. You'll see how to challenge ball reversals by pressuring your opponent and learn how to pin the ball on the side with basic team defensive strategies based on where the ball is located on the court. Ryan discusses how to position help defense, contest passes with denial defense, proper technique on closeouts, and how to optimize your hand positioning when guarding the ball. The best post defense is to never let a talented big touch the ball. Coach Ryan shows how to deny the post without getting exposed to seals. See how to fight for position to dead front the post and learn how to keep the defense guessing with a strategy to deny the pass into the high post. Develop your players' skills and understanding of defensive concepts with 12 practice drills. These drills will give you the tools you need to refine the fundamentals of your individual defenders and establish a strong foundation for your team defense. Train tenacious on-ball defense with a progression of drills that will teach the defensive stance, improve lateral movement with lane line slides, speed up your reaction time, and more. The Two Deads and a Charge Drill will teach your players how to direct the dribbler up the floor, increase your pressure in dead ball situations, and the proper technique for taking a charge. Additional drills help you instruct players on concepts such as close outs, denial defense, and busting through screens. Three competitive drills will motivate players to protect the rim with great communication and help defense. The 4-on-4 Open Post drill adds an extra player at the high post that can attack the rim. The defenders must react in order to help and contain the drive. Opponents are going to test any man-to-man defense with a variety of screening actions. Coach Ryan breaks down his approach to defending seven types of screens including down screens, up screens, fade screens and staggered screens. You'll see two methods for defending double screens depending on how your opponent tries to use the action to score. Force your opponent into the lowest percentage plays on ball screens. Against high ball screens, Ryan demonstrates how to have your post "wall up" in order to push the dribbler wide. You will also see how and why to switch side ball screens. See all the items in this series! See related products: Bundle & Save!